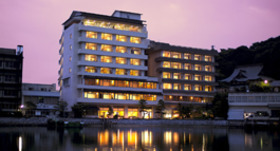 Enjoy the warm hospitality and relax your five senses at Kikusui-tei. The Kikusui-tei is located on the east side of Lake Hamamatsu which spreads out over the western end of Hamamatsu City. It is a hotel that not only has an outdoor bath with a view of the entire lake, but also serves the most colorful and freshest cuisine using seasonal ingredients produced locally. Besides having each of the 2 types, indoor and outdoor baths, there are also 3 other private outdoor baths that are available for booking by hotel guests. You can have a relaxing time with your family and friends, or enjoy it together with your lover. In addition, there is also a ¥1000 bus tour that is conducted by the local staff visiting the seasonal attractions in the Kanzanji onsen (hot spring) area. Many tourists visit the Kanzanji onsen where various leisure facilities lie within walking distance. On the bus tour, you may get to see seasonal attractions that are known only to the locals and cannot be found in any guidebooks. 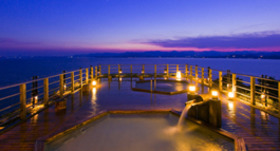 The luxury relaxation spa "Tawamure no Yu" uses an authentic jacuzzi the "sundance spa" while the outdoor bath, "Kimorebi no Yu", is a refreshing Japanese-style bath with tatami mats that allows you to enjoy the colors of the four seasons in the garden. Each of these baths creates its own special sense of space and ambience that helps relieve fatigue and soothe the tired soul. ※At the Tawamure no Yu, shampoo and soap cannot be used. For safety reasons, children under the age of 5 are not allowed in the bath. 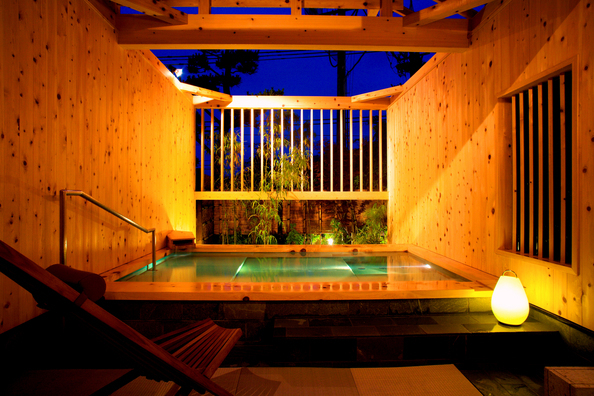 In addition, there is also a spacious "Kaori no Yu" bath for guests in wheelchairs. It has a relaxing ambience where one can get enjoy the scent of different seasonal flowers in the garden throughout the year. Handicapped guests can thus, also get to enjoy the bath in a safe and secure manner. Each guest room comes with its own outdoor private bath that affords a sweeping view of Lake Hamamatsu. With a lake view right in front, above you lies the wide blue sky that is dotted all over with stars at night. You will probably get lost in time as you lay back and enjoy the magnificent natural scene that seems to be constantly changing its expression as time passes. 3 types of guest rooms are available in the East and West Annexes. All rooms come with lake-side windows that provide a sweeping view of the lake. The sight of the setting sun gradually disappearing over the lake bathed in a sea of orange is simply stunning. The Japanese-style suite rooms are luxuriously wide and spacious while the Japanese-Western rooms are equipped with dining tables. ※The rooms in the older East Annex are fitted with old, unit-type bath and toilets. Although they are recommended for those looking for a good deal, we do not recommend these to guests who are more particular about the grade of their rooms. 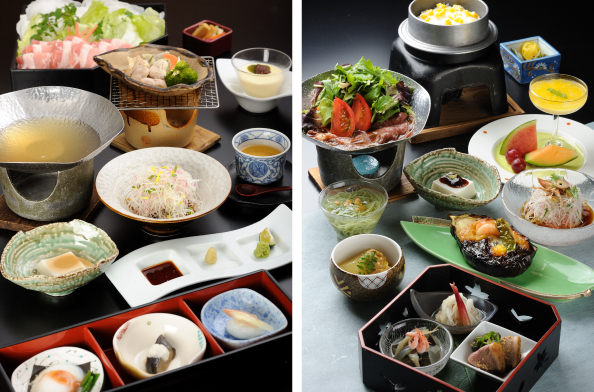 At Kikusui-tei, healthy and wholesome meals mainly using seasonal vegetables are served. Each and every dish is served in the right portion and hand-made with tender, loving care that delights you to your very core. Kaiseki gourmet used to be meals that inn owners served to their guests as a sign of their hospitality. 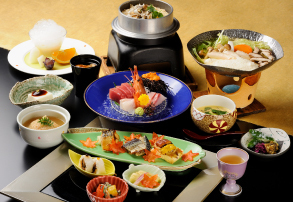 Enjoy the warm hospitality that Kikusui-tei offers. In addition, accommodation plans with different meal courses are available for guests to choose from. These are recommended for those who want to savor a greater variety of seasonal ingredients. Open from 8pm onwards, the Hanaikada lounge serves the finest shochu and umeshu and its Hamamatsu-style gyoza (dumplings) and miso-ramen (noodles) are also popular. How about soothing your body with a little chilled sake after a warm bath? Provides a relaxing time and service to help relieve fatigue from your travel and daily work. ※Men are welcome to use this service. ※Pregnant women will be counseled on their preferred course of treatment. ※Service may be refused to those not feeling well or those with physical conditions. ※All staying guests enjoy a 10% discount for all courses. 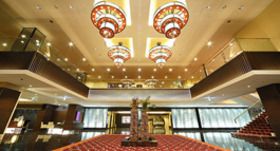 Upon arrival, all guests will be welcomed by the hotel staff with a complimentary welcome drink. Language Chinese and English-speaking staff member are available. Take the "Kanzanji Onsen" line bus (45 minutes ride) at bus stop #1 of the bus terminal to "Hamanako Bay Street" then walk 1 minutes.